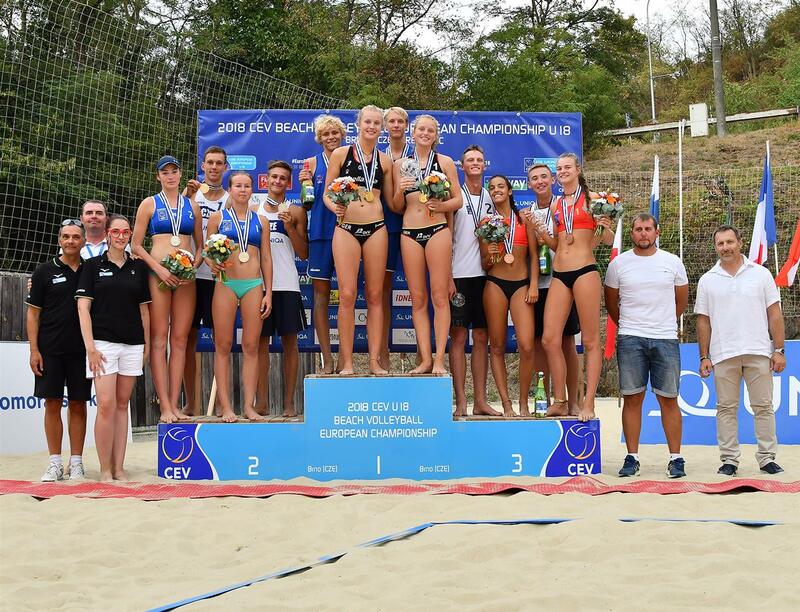 Europe’s future kings and queens of volleyball have been crowned at the U18 Beach Volleyball European Championships, played in Brno in the Czech Republic from August16-19, this Sunday. The competition’s main draw saw 32 men’s and 32 women’s teams. Jonatan Hellvig and David Ahman were victorious in the boys’ competition, while Svenja Müller and Lea Sophie Kunst were the best ones among the girls. Germany’s Kunst/Mullher defeated Russia’s Mariia Bocharova / Elizaveta Ludkova 2-0 (23-21, 21-16) for the women’s crown. Their path to the finals also included wins against Denmark’s Windeleff/Bisgaard in the Round of 16, Latvia’s Grosberga/Briede in the Round of 8, and Czech Republic’s Honzovicova/Sulcova in the semis. Sweden’s Ahman/Hellvig defeated Czech Republic’s Jan Vodička / Tadeáš Trousil 2-0 (21/18, 21/10). Their path to the finals also included wins against Poland’s Florczyk/Nowak at the Round of 16, Estonia’s Lõhmus/Tammearu in the Round of 8, and Russia’s Veretiuk/Shekunov at the semis. The gold medal duo also claimed first place and a ticket to the 2018 Youth Olympic Games in Baden earlier this year at the 2018 CEV Youth Continental Cup Finals. The Czech Volleyball Federation has been working hard to develop Beach Volleyball across the country, including hosting the CEV U18 Beach EuroVolley in 2012, 2016, and now in 2018. Its activities have produced some terrific results, with more than 3,000 kids having registered for participation in Beach Volleyball clubs since 2012. The country has over 100 indoor beach facilities, including 66 in the capital Prague.